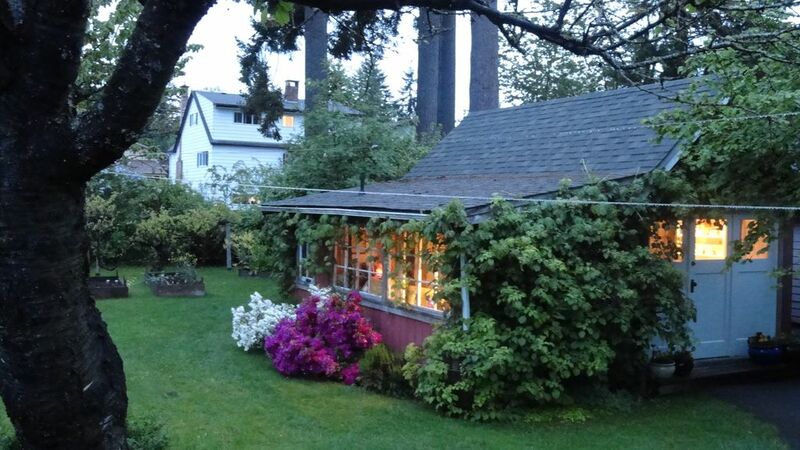 Come and enjoy this quiet little garden oasis hidden in the heart of Duncan. Tastefully furnished one bedroom garden cottage with fully equipped kitchen, laundry, TV/DVD, free WiFi and sun-drenched private rear patio with BBQ. Parking for 2 vehicles, bus stop or walking distance to downtown, Queen Margarets School & also to Cowichan District Hospital. Area famous for vineyards, cycling, hiking, golf, totem tours, organic cafes, boutique shops & farmers market. Rivers, lake and ocean all minutes drive proximity. Quaint little cottage, in a private garden space. Private, self contained cottage with all the necessary amenities. Please bring your slippers, no outdoor shoes in the cottage. Coffee, tea, spices and some staples i.e. sugar, honey, flour and rice. We have a great pay it forward system where visitors leave extras behind and add to the staples for the next people. Full kitchen with everything you would need for meal preparation. Please bring your slippers, no outdoor shoes in the cottage. Cozy, quiet, well appointed, lovely host. I recommend. Great location. Wonderful self contained cotrage in beautiful setting. We enjoyed our stay at the Duncan Cottage. The service was great and everything was clean and neat. We would go back in a flash. The cottage is cute as a button with everything you need and located within walking distance to town. We had a wonderful stay. Felicity is very hospitable and the place is well equipped. Great location for exploring the area as well as close to delicious restaurants and shopping. Quiet residential street adds to the whole "Home Away" experience. Highly reccommend staying here. Take Beverly Street from the Trans Canada #1 Highway. Right at end onto Canada Avenue, 1st Left onto Philip Street and 1st Left onto Islay Street. Following signs for Hospital from the highway. Located in the Cairnsmore area, the older residential part of Duncan, walking distance to Cowichan District Hospital, VIU, Queen Margaret's School, downtown shopping. There is an extra charge of $10.00per night for use of the second bed in the loft space to cover extra laundry. Also people using the loft need to sign a release of responsibility form. Please bring your slippers, no outdoor shoes in the cottage.